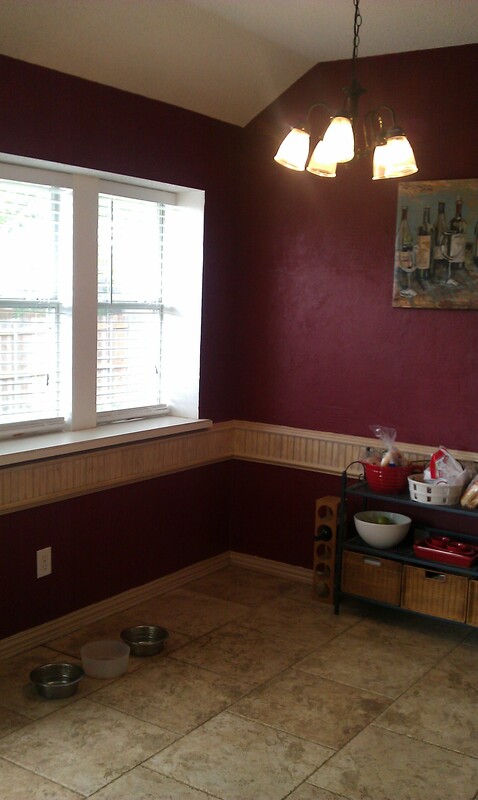 There are a lot of things I love about our house, but our breakfast nook is not one of them . . . or, I should say, it wasn’t. This is the boring, before picture . . . I should probably mention we did NOT choose this color. We just had to live with it. Until this weekend the baker’s rack and print were all the personalizing I’d done in this space, but can you blame me? I mean, that’s a seriously dark color! Quite frankly I was intimidated by the thought of trying to tackle it. Thankfully inspiration struck in the form of a leftover can of paint. 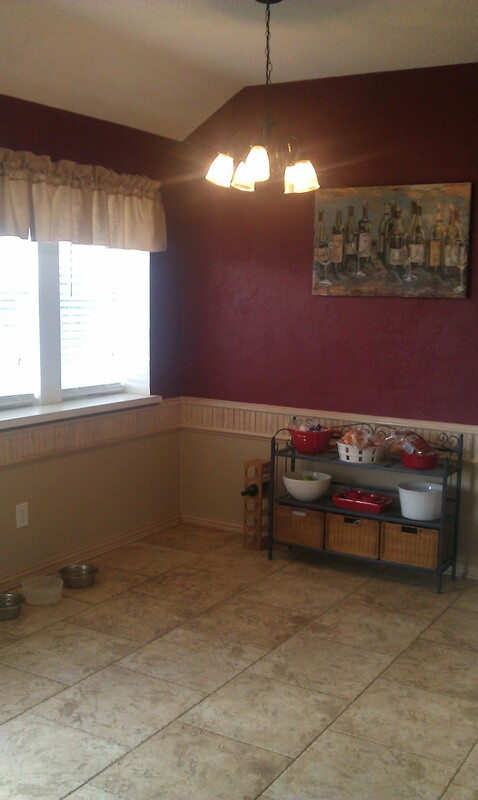 I realized maybe, just maybe, I could manage a little face-lift for this blah corner of my kitchen. The result? Well, I love it! Look at all that light! I have to admit I’m amazed at what a difference a little bit of paint and some curtains made. Before the color was harsh and overpowering. Now it’s more of an accent to compliment the rest of my red decor. The pretty valance adds softness and brings the lighter color up, helping to break up the dark walls further. My hope with this project was just to make the dramatic color live-able until I could muster the courage to tackle the whole thing. The outcome far exceeded my expectations and I couldn’t me more pleased with the result. Now all I need is a bistro set . . . hmm, I feel another DIY project coming on. Whether you’re a homeowner like me or and apartment-dweller like Christine, here are a few tips for making your space your own. 1. Don’t overwhelm yourself with too many projects. Figure out what absolutely needs done and what you can live with. You’ll be amazed at how you can make things work with the right touches. Just try to think outside the box. Browse pinterest or just walk through the home improvement stores and inspiration will find you! 2. Got an overwhelming color like this one? Try breaking it up. Adding light accents and curtains can really help to temper the drama. You could even try adding your own chair-rail and painting the lower section like I did! Depending on the trim you choose it can be an inexpensive fix. Just make sure you, or your friends, have got the right tools on hand to level and install it properly. 3. Paint + Prime. Trust me, it’s a lifesaver, especially when you’re trying to cover dark colors. I was hesitant to buy it for a previous project and at the time I felt we got talked into getting it at the store. However, it turned out to save me so much time. Rather than trying to prime and/or paint several coats, I used Behr Paint and Primer in “Mushroom Bisque.” The result is fantastic, no reddish tinge just the true tan color I was hoping for. Just don’t forget the most important step in painting . .
4. Prep. Clean the trim, make sure the tape is straight and stuck down, cover the floors. How disappointed would you be in yourself if you had nice, freshly painted walls only to realize you’d made a mess of your trim and floors?! Exactly. Also, for a flawless paint line I’ve found it’s much better the remove the tape as soon as you’re done with the last coat. If you let it dry you run the risk of peeling up paint with the tape! If you have any questions on your own DIY projects just ask . . . If I don’t have an answer you can probably bet I’d come up with a project just to find out!